Ahhh ... Drunk Elephant Skincare! I ALWAYS hear really good things about this HIGH END skincare company. Just like Tatcha (that I reviewed yesterday), Drunk Elephant also has deluxe sample sizes for many of their products. Yaaay! So this past Christmas (just as I did with Tatcha), I decided to pick up a few things from the Drunk Elephant skincare line to try out for about a month. Let's see, shall we! Drunk Elephant has TWO types of CLEANSING BARS! 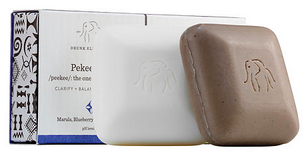 Yes, they look like SOAP (but they are considered SOAP-FREE); Drunk Elephant wants you to call them cleansing bars. The JuJu Bar (brown one) is for use in the MORNING! The Pekee Bar (white one) is for use at NIGHT! You can get BOTH of them in this travel duo (they'll be slightly smaller) or you can purchase them separately (full size). I bought the travel duo. The bars are just large enough to see if you want to incorporate them into your skincare system or not. Below are my thoughts on each. This bar is to remove dead skin cells from the surface of the skin. The formula is thermal mud and bamboo powder. I must admit, this is an excellent exfoliator! It lathers up really well. As you lather, it releases these exfoliating particles (but do know, this bar "melted" faster than the Pekee Bar below). You can feel the particles! This bar leaves your skin clean, smooth & polished. I have dry/sensitive skin. I never experienced any major adverse reaction while using this bar. After use, I had slightly rosy cheeks (probably from the exfoliation), but no major redness or peeling. This bar started off really good with my skin, but around the second week I did experience some dryness. Never dry patches or flakiness, but dry skin. In comparison to my other cleansers, this didn't seem as gentle (for everyday use) to my skin as my REN cleanser or Tatcha enzyme cleanser. Over the long run, I feel this is too much to use DAILY for dry/sensitive skin types. Maybe WEEKLY or Bi-Weekly. I feel this would work better for Normal, Combination & Oily Skin Types. If you have dry or sensitive skin, I would use caution using this daily. I'm definitely not a dermatologist, but I don't think dry/sensitive skin types need this amount of daily exfoliation. This bar "DEEPLY CLEANSES, tones and moisturizes without stripping or irritating the skin". This bar lathers up really well. It's creamy. If I had to sum up this bar in one word, I would say CLEAN. Your face feels REALLY clean after using this (usually when it is this clean, there is some type of stripping). I think you can almost skip removing your makeup and just use this. HaHaHa I do think over the long term (just like the Juju Bar above), this is better for Normal, Combination & Oily Skin Types. Again, I didn't experience any major adverse reaction while using this bar, but I did experience some dryness around the second week. It sounds funny saying, but for dry/sensitive skin people, I worry that it's TOO CLEAN for everyday! Maybe once or twice a week for a deep clean, but not daily. Let's start with the C-Firma Day Serum! It's suppose to FIRM & BRIGHTEN the skin! It does a great job at doing both! It made my skin feel FIRMER and my skin looked BRIGHTER. My skin felt firm, plump & refreshed (those were the end results). When you apply this, it feels WET. Then it turns a little STICKY. It takes about 15 minutes for it to DRY DOWN. I kid you not! It dries without leaving a residue or any stickiness and you'll get those great results. I might consider incorporating this into my skincare system. I recently tried a product from REN that firms & tightens the skin. It is absolutely amazing! Review will be coming soon. But it doesn't brighten like this product! The B-Hydra Intensive Hydration Gel is suppose to quench (ultra-hydrating vitamin B5) dry thirsty skin & brighten it as well. Well, my skin is still thirsty! LOL This WILL NOT give DRY SKIN TYPES intense hydration. IT WILL NOT! If you have normal, combination or oily skin, it will probably give you the moisture you need, but NOT IF YOU HAVE DRY SKIN. It's just not enough. This applies wet. Then turns a little sticky. It takes 15 minutes to dry down. Put them both on and allow for 30 minutes for them to dry down on your face. Both of these are really, really good. You should start off using the TLC Framboos Glycolic Night Serum! It's a serum to be used at NIGHT, that refines & resurfaces the skin. It's a 12% AHA/BHA serum. You should then apply the Virgin Marula Luxury Facial Oil. It's suppose to be rehab for your skin, rich in antioxidants and omegas. NOW, YOU MAY NOT LIKE HOW THEY LOOK OR FEEL ON YOUR SKIN WHEN YOU FIRST APPLY THEM (I DON'T)! They apply wet. Then they turn a little sticky. Then they dry down. But let BOTH JUST MARINATE (HaHaHa) ON YOUR SKIN OVERNIGHT. You will wake up to such SOFT, SUPPLE, GLOWING glorious skin. My skin LOVED these (IN THE MORNING, HaHaHa)! The prices are crazy outrageous, but I love how my skin FELT and LOOKED. I could definitely see that it was re-textured. I never used them separately! Only together! So I don't know how they perform separately. The website also mentions that you may experience a tingle. I never experienced that. My Final Thoughts: Overall, I think Drunk Elephant Skincare is more appropriate for Normal, Combination, and Oily Skin Types. If you have Dry or Sensitive skin, definitely try the deluxe sizes before investing in full sizes. See how your skin reacts. I experienced some dryness around the second week of using some of these products. The only thing I don't like about most of their products (serums, moisturizers) is that they're so STICKY! However, that stickiness goes away. For me, the products are not very pleasant to put on. So I'll be sticking with REN or Tatcha at the moment. I SUPER LOVE Drunk Elephant's nighttime products! I may incorporate them into my nighttime routine. I feel they are beneficial to all skin types. 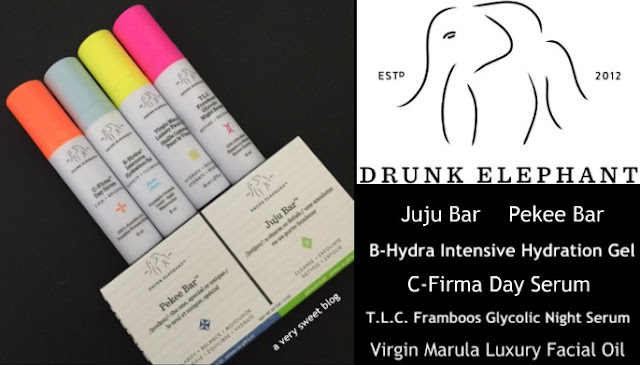 I am interested in trying Drunk Elephants TLC Sukari Babyfacial and their Lala Retro Whipped Cream. Have you tried Drunk Elephant? Tell me what products? What did you like/didn't like? I purchased Tatcha's Bestsellers Skincare Set ($59) from Sephora around the end of last year. I've been interested in the Tatcha brand ever since I won some Tatcha Japanese Beauty (Blotting) Papers from fellow friend & blogger Rowena of Rolala Loves blog. Even though I'm not oily (dry skin), I was very impressed with how well the papers absorbed oil. I decided to follow Tatcha on Snapchat to learn a little more about the company and I was charmed by their Geisha inspired ... "ritualistic" ... philosophy to skincare. This set is no longer available at Sephora, but Tatcha has put together sample skincare sets SPECIFIC to your SKIN TYPE (sensitive, dry, oily, normal). All skincare sets are $59. Tatcha is definitely HIGH END SKINCARE. Their cleansers alone are $65. My beloved REN cleanser is $28. So I'm happy they have put together these SAMPLE KITS so consumers can try them without breaking their bank accounts. I remember way before I started blogging, spending a s*itload on the entire La Mer skincare system only to find out it didn't do a thing for my skin. LOL It didn't hurt it, but there were NO benefits. I've been cautious ever since. So read below to find out my feelings on Tatcha and if I will switch from my beloved REN Skincare. Also let me know if you've tried anything from Tatcha. The packaging for Tatcha (even these deluxe samples) are as serious as their prices. They definitely do not skimp and there is nothing flimsy about them. All the packaging has a hard, plastic-glass like feel to them. They're sleek and feel high end. They will definitely display beautifully in your bathroom. I also love the purple, gold & white frosted color scheme to their entire skincare collection. In this box, the Classic Rice Enzyme Powder was included. The Classic Rice Enzyme Cleanser is for Normal to Dry Skin. I want you to realize, they have three (3) other cleansers (shown below): Soothing Rice Enzyme Powder for (Sensitive Skin), Gentle Rice Enzyme Powder (Dry Skin) and The Deep Polish Rice Enzyme Powder (Normal to Oily Skin). All of these cleansers are in POWDER FORM and are housed in a double-walled jar. The only way to access the powder is to slide a little tab located at the top of the jar. You then shake the powder (dispensed from a tiny circular opening) into your slightly damp hands and make a paste that you apply to your face. Tatcha recommends a 1/2 a teaspoon of powder, but I found myself using more to get my face clean. The cleanser feels really good to the skin and your skin feels cleans after using this cleanser. I have Dry/Sensitive skin and I didn't experience any adverse reaction to the Classic Rice Enzyme Powder. I think long-term, either the cleanser for Sensitive Skin or Dry Skin would be better for me. I think I'm going to try both of those kits to see if I want to switch from REN to Tatcha. But overall, it's an excellent cleanser! It's just finding the right one for your skin type and getting use to activating the powder. Tatcha's Moisture Rich Silk Cream is creamy and light as a feather. I applied it to my face and said ok, it's nice. But when you leave it on and feel your face after a couple of hours, you REALLY feel a difference in your skin! It's so soft, supple and moisturized. I loved how it made my skin feel. But at that price, YOUR SKIN SHOULD FEEL THAT WAY! HaHaHa The Silk Cream was great, but I feel my skin needs just a tad more (Enriching Renewal Cream). Just like the cleansers, Tatcha has a moisturizer for all skin types! Unfortunately for drier skin types, the price gets HIGHER! The Water Cream Moisturizer is for (Normal to Oily), The Silk Cream Moisturizer is for (Normal, Combination/Dry), The Enriching Renewal Cream is for (Dry Skin) and the Soothing Triple Recovery Cream which is recognized by the National Eczema Association is for (Sensitive Skin). There's also a Pore Perfecting Water Gel Moisturizer (not pictured) for (Oily Skin). I don't have that much experience with skin mists, but Tatch's Luminous Dewy Skin Mist is how all should be! LOL I've had mists to spray too "hard", leaving your face a wet mess. I've had them spray like water only to dissipate as quickly as you've sprayed. Tatcha's sprays like a very fine delicate mist of water. However it turns into what feels like an essence once on the skin. It provides ample, light hydration. I really liked it. I only tested this on bare skin and by the time I wanted to test it with makeup I unfortunately ran out. So I can't vouch to how this would react with full makeup on. That is why I give it a Sweet rating. Tatcha's One Step Camellia Cleansing Oil is Tatcha's makeup remover. This was the only product that didn't float my boat. It's not bad (it works), but I didn't like the experience (let me explain). It truly FEELS like a heavy oil (and I hate that). It feels like cooking oil on the face! LOL BUT!!! It removes makeup very well and when you wash it off, you no longer feel oily and your skin feels soft & hydrated. So that's why I rated it Bittersweet. But I wouldn't buy this on my own. You guys know I just reviewed Clinque's Take The Day Off Cleansing Balm and I much prefer it.